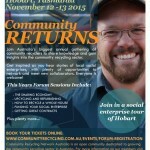 HOBART: Social Enterprises talk re-use and recycling. The Community Recycling Network of Australia’s annual forum is a gathering of community recyclers, waste industry professionals, and local government representatives who are passionate about supporting the growth of community recycling in Australia. In 2015, the event was held on the 12th and 13th November. The theme ‘Community Returns’ celebrated partnerships and collaborations between community recycling enterprises, communities, local governments, and businesses. For more information and the full Forum program, visit the CRN Australia website.